Your heart rate is one of the most exact ways to measure the intensity of exercise. Consumer Reports explains how to choose your target heart rate for exercise. If you have a fitness tracker or smartwatch, you might have noticed that your device provides you with a regular report on your heart rate. Or perhaps you regularly use a treadmill or an elliptical equipped with a chest strap or a built-in heart rate monitor and you’ve wondered whether you should use one of those devices. Heart rate is one of the best tools we have to to gauge exactly how hard you are working, according to Phil Clifford, Ph.D., associate dean for research in the College of Applied Health Sciences at the University of Illinois at Chicago. Heart rate can help you assess whether you’re meeting your own personal goals or federal fitness guidelines, which say most Americans should aim for a minimum of 150 minutes of moderate-intensity exercise or 75 minutes of vigorous-intensity exercise each week. Hitting those guidelines will improve your overall health and heart health, lower your risk for chronic diseases such as diabetes and for various forms of cancer, improve your cognitive function, boost your mood, improve sleep, and more. 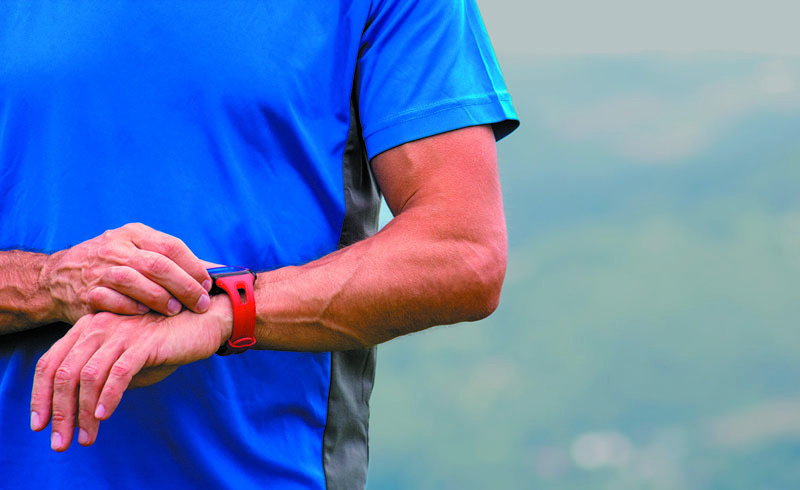 Measuring heart rate can help you learn whether your workout is moderate, vigorous, or not quite either—so you can adjust accordingly. Heart rate measures how many times per minute your heart beats. When resting, the average person’s heart beats 60 to 100 times per minute, according to the American Heart Association. In general, fitter people have lower resting heart rates—trained athletes’ hearts might drop to as low as 40 beats per minute (bpm) because they are functioning more efficiently. As your muscles start pumping when pushing through an aerobic activity, such as running, biking, or swimming, they need more oxygen. That’s why you breathe harder and your heart starts pounding. Each beat pumps oxygen-filled blood through your body, which is why tracking your heart rate can tell you just how hard you’re working. “Heart rate is a stand-in for what scientifically is measured as the volume of oxygen you’re consuming,” says Peter Anzalone, senior test project leader for fitness equipment at CR. If you are going all out, the measurement of how much oxygen you’re capable of consuming is known as your VO2 max, which researchers consider the best measure of fitness capacity, according to Clifford. 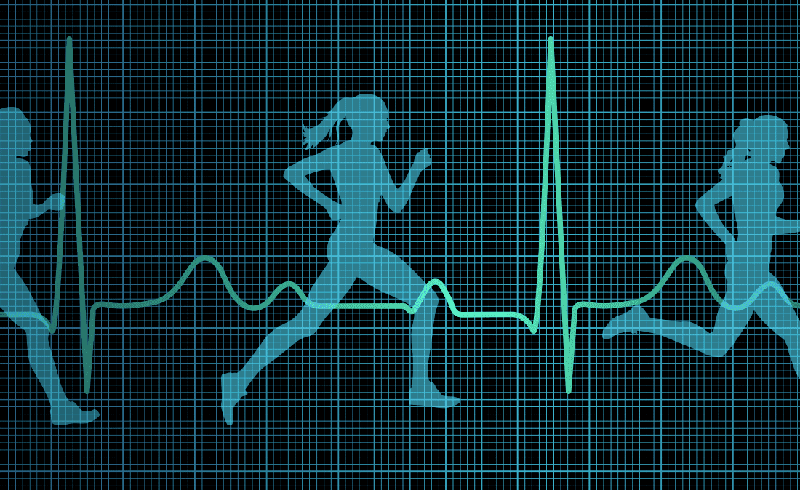 Should You Track Heart Rate? If you are sedentary and just beginning to exercise, you don’t need to track heart rate, Clifford says. Instead, start by just trying to move more. One of the key points of the November 2018 update to the federal fitness guidelines is that your first goal should simply be to increase your activity level overall. “There’s a health risk to just sitting, and it can be counteracted by just getting up and moving,” Clifford says. Once you’re comfortable with some exercise, you can start striving toward hitting fitness targets for moderate intensity exercise. If you are at this point, tracking heart rate could help you figure out whether you’re doing enough to reach an intensity level that’s considered moderate, Clifford says. Moderate exercise is as good as vigorous exercise for overall health benefits, says Cris Slentz, Ph.D., an assistant professor in the departments of medicine and cardiology at the Duke Molecular Physiology Institute in Durham, N.C. But you’ll need to incorporate vigorous workouts into your routine if you want to improve your overall athletic capacity. If you are just starting to make the intensity of your exercise sessions more vigorous, measuring your heart rate could help you understand how those workouts should feel. And more serious athletes, like anyone training for a 10k or half-marathon, will get the most benefit from tracking heart rate regularly, so they can make sure they’re training at the appropriate intensities, according to Clifford. Having an objective measure is useful in these cases, he says, because subjective measures like your perceived exertion can vary day to day. Because of that, using heart rate is an excellent tool for athletes and can also encourage more typical fitness enthusiasts to push themselves, experts say. You can also estimate levels of exertion without tracking your heart, Slentz says. During moderate exercise, your breath should speed up a bit, and you’ll begin to sweat after about 10 minutes, according to the Mayo Clinic. You should be able to talk, though not sing. During vigorous exercise, it’s hard to say more than a few words. If you are going to track your heart rate, you’ll need to use a monitor. Chest strap monitors are probably best in most cases, according to Anzalone. These are worn around your chest, directly against your skin, and detect your heart rate electronically. Monitors built into machines like treadmills and ellipticals can work, but they may not always provide you with a reading that’s as useful, Anzalone says. Grabbing the handholds so that your heart rate can be measured often means exercising in an unnatural way—you wouldn’t normally run with your hands clasped on a bar in front of you, which could make your reading a little different from what it’d normally be. You can use your heart rate to measure and change up your exercise intensity, which will help you plan and understand your workouts better. There’s not a particular heart rate that corresponds to a particular intensity; instead, it’s different for each person. To figure out which levels of exertion count as moderate or vigorous exercise for you, you perform a calculation based on what’s known as your heart rate reserve, according to the American College of Sports Medicine’s Guidelines for Exercise Testing and Prescription. There are a few steps involved, so get your calculator or pencil ready. Calculate your maximum heart rate. Subtract your age from 220 for your estimated maximum heart rate. The number you get may vary by up to 20 bpm from your actual maximum heart rate, but this is a standard way way to estimate without doing a stress test. You may have a more exact number if you’ve done a maximum exercise stress test or if you are an athlete who has measured your heart rate after an all-out level of exertion. Measure your resting heart rate. You can do this with your fitness tracker or by using a timer and counting how many times your heart beats in a minute. You can also count how many times it beats in 15 seconds and multiply that by four. Calculate your heart rate reserve. Subtract your resting heart rate from your max heart rate. Find your ranges for moderate and vigorous exertion. Your heart rate range for moderate intensity activity is 40 to 59 percent of your heart rate reserve added to your resting heart rate. Your heart rate range for vigorous intensity activity is 60 to just under 90 percent of your heart rate reserve added to your resting heart rate. For example, take a 35-year-old with a resting heart rate of 60. Her estimated max heart rate would be 185 bpm (220 minus 35). Her heart rate reserve would be 125 (185 minus 60). She would be exercising at a moderate level once her heart rate reached 110 bpm (40 percent of 125 plus 60). She would be exercising at vigorous level once her heart rate reached 135 bpm (60 percent of 125 plus 60). Her exercise level would still be considered “vigorous” up to a heart rate of 172.5 bpm (90 percent of 125 plus 60). Going above that vigorous level can be dangerous if you have underlying heart problems or multiple risk factors for cardiovascular disease, according to Slentz, though it’s something that some people do during interval training or other all-out exercise. And if you have known risk factors or heart problems, you should also avoid exercise in the “vigorous” range unless you’ve consulted your physician. For anyone, activity at levels of exertion reaching 90 percent of max heart rate or above is extremely difficult to sustain. Once you have a sense of how vigorously you are exercising, you can map out your workouts to ensure that you are hitting the minimum exercise guidelines suggested by the government—or, better yet, surpassing them. You can also push yourself to specific targets, give yourself goals based on actual (rather than perceived) exertion, and use your heart rate to help plan interval workouts.